The focal point of the development is the twin triangular shaped towers which sit above a sculpted three-story podium. 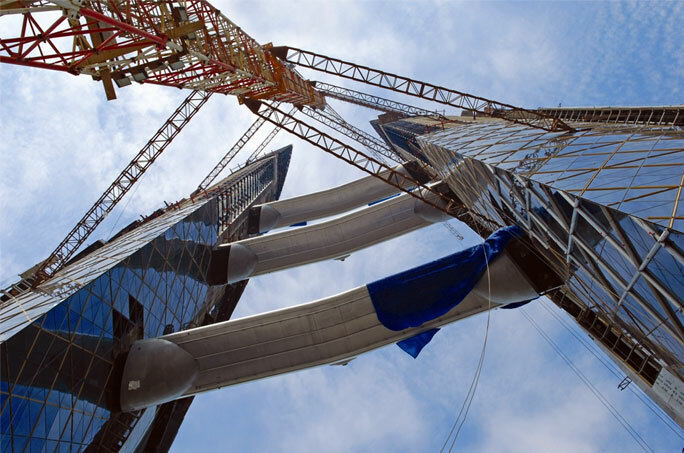 Tapering to a height of 240m, each tower is visually anchored to the ground by a concertina of curved, sail-like forms, and provides 34 floors of office space and an exclusive viewing deck on the 42nd floor. Unique to this building and rising to the challenge of incorporating renewable energy solutions within sustainable architecture, the Bahrain World Trade Center design includes three 29m diameter wind turbines horizontally supported on bridges. The turbines are expected to produce between 11 and 15 percent of the total electrical consumption of the towers. The project was client represented by HAJ and several leading contracting companies are involved for various services. It was designed by WS ATKINS & partners and NASS MURRAY ROBERTS JV was the main contractor. The Mechanical contracting was undertaken by M/s. Emco WLL in Joint Venture with M/s Mercury Middle East WLL. Airtech was awarded the installation and commissioning of complete HVAC ducting system for the entire building as per the DW144 for HVAC ducting. The Total area of Ducting fabricated , supplied and installed was 70,000 Sq Mtrs of Thermally insulated Galvanised ducting. 15,000 Sq Mtrs of aluminum cladding with stucco embossed aluminum sheets for plant room duct works. 7,500 Sq Mtrs of aluminum cladding with stucco embossed aluminum sheets for plant room chiller pipes.